Quality Gardens, Inc. is located at 409 Route 228 West. Owner and operator, Tom McMeekin, started the business in 1986 as a 9,000 square foot greenhouse. It now includes: 32,000 square feet of greenhouse space; 20,000 square feet of outdoor nursery space; a one-of-a-kind 5,000 square foot glass garden center; 2 ½ acres of chrysanthemum production and landscape services divisions. In April 2015, Tom’s daughter Christine opened Bloom Cafe in the former Hawkins Farm Market at Quality Gardens. Now you can enjoy a latte, fresh strawberry-lemonade or ice cream cone while you shop, or take time to munch on one of Bloom’s delicious specialty sandwiches or salads on the backyard patio! We are proud to present an extensive collection of quality annuals, perennials, trees and shrubs, and water plants. All of our hardy plants are appropriate for Western Pennsylvania gardens. Our garden center is filled with truly unique items for your garden and home, including handmade artisan pottery and jewelry. We refresh our stock with new and exciting items for every season. 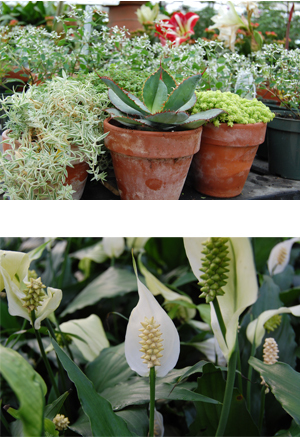 Knowledgeable staff members are happy to help you select plants to suit your needs. We are also here to help solve problems that you might encounter in growing them. You’ll also find that we offer a full line of garden products—everything you need to care for your plants and yard!